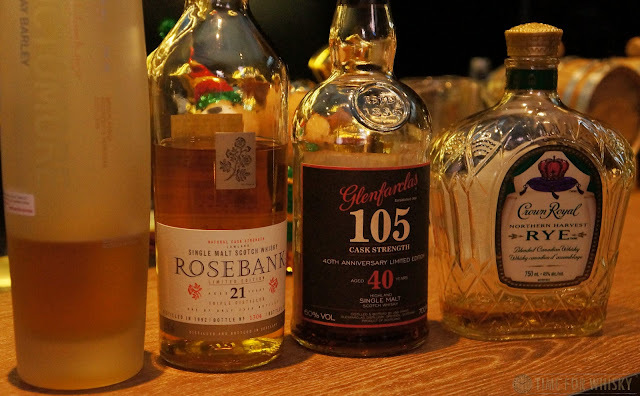 Our first post of 2016, and 6th tasting note for a 40 year old whisky (the others being from Balvenie, Glenfiddich, The Glenrothes, Glenfarclas and Master of Malt) comes courtesy of this Glenfarclas 105 40 year old, which I tasted recently at the excellent new Malt Whisky Bar in Sheung Wan, Hong Kong (review up soon). For those unfamiliar with the "105", it's Glenfarclas' sherried cask strength release, released regularly and considered by many to be one of the best value "sherry bombs" out there, often compared with Aberlour's A'bunadh. At $778HKD, $119.90AUD or £45.13, it's definitely one worth having in your collection (you can see our recent tasting notes with George Grant here). That's not the whisky above though. The whisky above is significantly more special. One of only 893 bottles, the 105 40 year old was released in 2008 to celebrate the 40th anniversary of the 105. Bottled at the same 60% as the regular 105, but with significantly more years under its belt, I was particularly keen to see how it fared with the other two Glenfarclas 40 year olds we've tried (and for that matter, the 50 and 60 year old Glenfarclas "secret Speyside whiskies" we've tried in recent years). Nose: Huge amounts of cola - rich juicy cola - sour 'Coke bottles' (lollies) and sour gummy worms. Exactly the same notes I've had on almost every single Glenfarclas I've tried over the age of 30 years (which is 8 and counting), but ramped up big time. Palate: Initially hot and a little closed up, but with clear notes of sherry-soaked dates, raisins and brazil nuts. With a few drops of water - almonds, red wine, aged leather, cigar smoke. Absolutely everything you want in a dram to just sit and "chew" on. Marvellous. Finish: Long and tannic, but beautifully so. Some heavily sherried whiskies can be overly bitter/drying (especially some older Japanese expressions, I find). Not this - it's perfect. Some cigar smoke, some earthiness, and a little more cola round it out. Rating (on my very non-scientific scale): 94/100. Absolutely fantastic. Worth trying without, and then with a few drops of water (but not too much). However you drink it, if you ever get the chance, you're in for a treat.